Though only the second-longest river in France (behind the Loire), the Seine is of key importance, as it flows through Paris. Starting on the Plateau de Langres near Dijon, the Seine weaves northwest for 485 miles to enter the English Channel near Le Havre. Along the way, it passes through Troyes, Fontainebleau, and Rouen. The Seine is France’s chief transport waterway, along with its tributaries the Marne and Oise. One of Europe’s few major rivers to flow directly into the Mediterranean (via the Gulf of Lion), the Rhône originates in the Swiss Alps and flows into Lake Geneva. It emerges from Geneva and flows south, passes through Lyon, Avignon, and Arles, and enters the sea just west of Marseille. At Arles, the river splits into “grand” and “petit” branches that encircle the island Camargue. The river’s valley is famous for its red wine, and because it is navigable for 300 miles, the Rhône is the key access route of southern France. In the corner of southwestern France, the Garonne and Dordogne rivers merge together to form the Gironde Estuary, which naturally divides the Bordeaux region into the Left and Right banks. Travelers from around the world flock to this region that is well known for its many gastronomic delights. Bordeaux has been a center for wine trade for nearly 2,000 years. The Romans, who conquered the region in 60 BC, endowed Bordeaux with vineyards and wine production. Today, more than 10,000 wine-producing châteaux and 13,000 grape growers produce more than 50 appellations, many of which are world renowned and some of which are among the world’s most expensive wines. Captured in literature, art and Strauss’s famous “Blue Danube” waltz, this river is one of the world’s most romantic waterways. Extending for thousands of miles through Central Europe, the Danube flows eastward, passing four capital cities before emptying into the Black Sea. Most of the Danube is in Eastern Europe, but it begins in Germany’s Black Forest near Freiburg, crossing Bavaria before it enters Austria. In all, it passes through (or touches the borders of) 10 nations on its 1,785-mile course ending at the Black Sea. Chief tributaries include the Drava and Sava, and it passes through four national capitals: Vienna, Bratislava, Budapest, and Belgrade. Formerly known as the Ister, the Danube was often used to define a northern border for the Roman Empire. The Rhine begins in the Swiss Alps, (in German, the Bodensee), flows west along the German-Swiss border, then turns north to form part of the German-French border. The river then flows north and joins with the Meuse and Scheldt to enter the North Sea at a delta in the Netherlands. Cities along its course include Basel, Strasbourg, Mainz, Bonn, Cologne, and Rotterdam, and tributaries include the Main, Mosel, and Ruhr. The Rhine has played a strategic role in most German conflicts since the time of the Gallic Wars, but was not established as an international waterway until the Rhine Commission of 1815. German myth tells of the Lorelei, a nymph who lured sailors on the Rhine to their deaths. 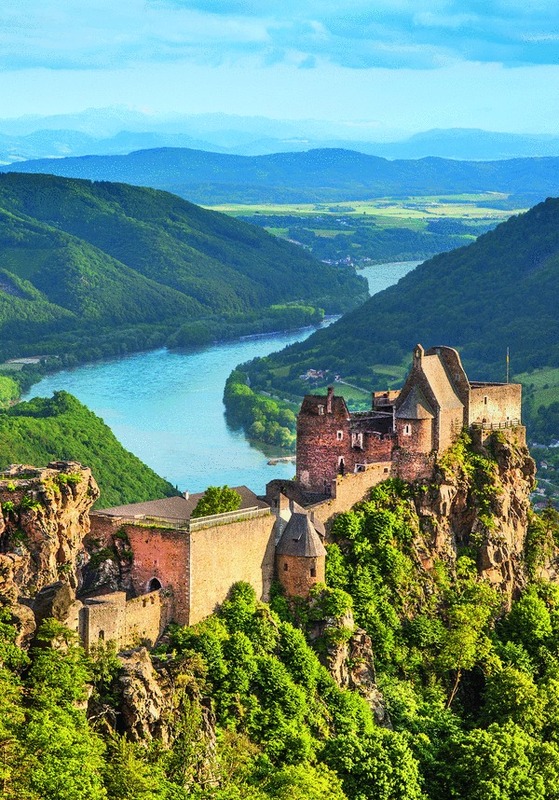 Along the Rhine are captivating sights that include castles, stunning vineyards and verdant valleys.